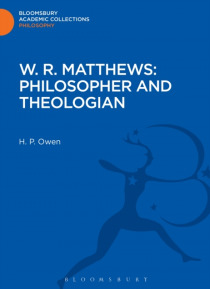 Over many years W. R. Matthews (who was successively Professor of the Philosophy of Religion at King's College London, Dean of Exeter and Dean of St Paul's) wrote copiously on both philosophy and theology in books, lectures and sermons. Although associated with the movements known as 'modernism' and 'liberal Protestantism' he was essentially a Christian Platonist who moreover was theologically ort… hodox on all vital points. Professor Owen quotes widely from Dr Matthews' published writings on The Concept of God, Religion and Reason, and Christology and Ethics. He brings out their significance both for an understanding of the ways in which religious thought developed in the first half of this century and for the light they shed on questions discussed by theologians today.